In the heart of the ancient section of the city of Catania lies an architectural testimonial to the city’s history. 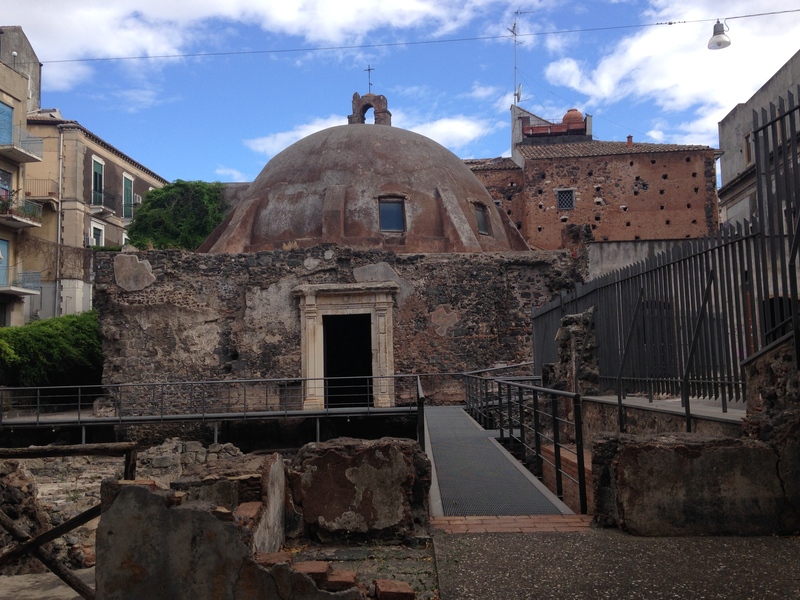 It is the Terme della Rotonda, the Roman Bath ruins where one can find the layers of two thousand years of Catania’s history. 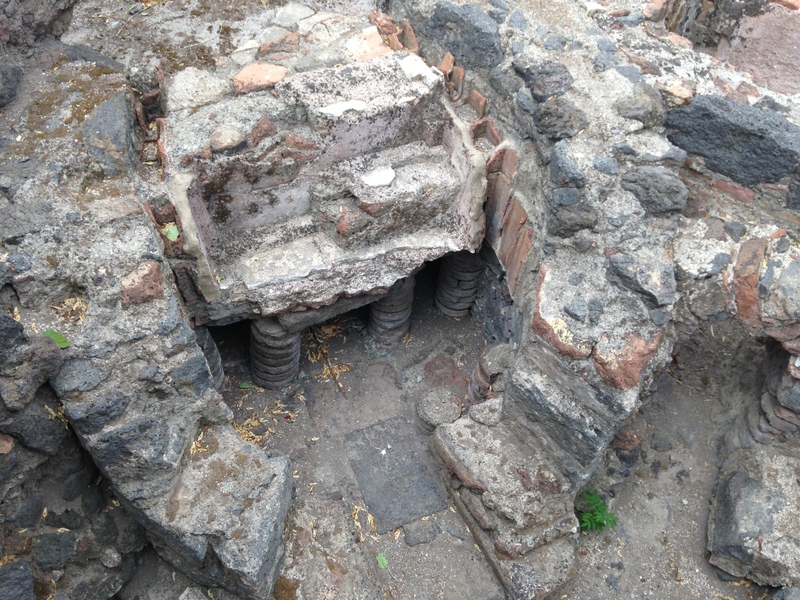 Nowadays, what remains of the Roman Baths is below street level. The Baths were built in the first century A.C., modified in the third and abandoned in the fifth. Roman Baths were an important element of Roman lifestyle and when the Empire ended so did their purpose, as the Christian lifestyle of the times did not lend itself to this kind of practice. As one can often see in Roman structures, there were elements which still display today great practices in construction. For instance, in the circular structure seen below there were some lateral columns that separated the two levels of the structure. The purpose was to allow hot air to travel between the two levels and escape through the open bricks on the sides. 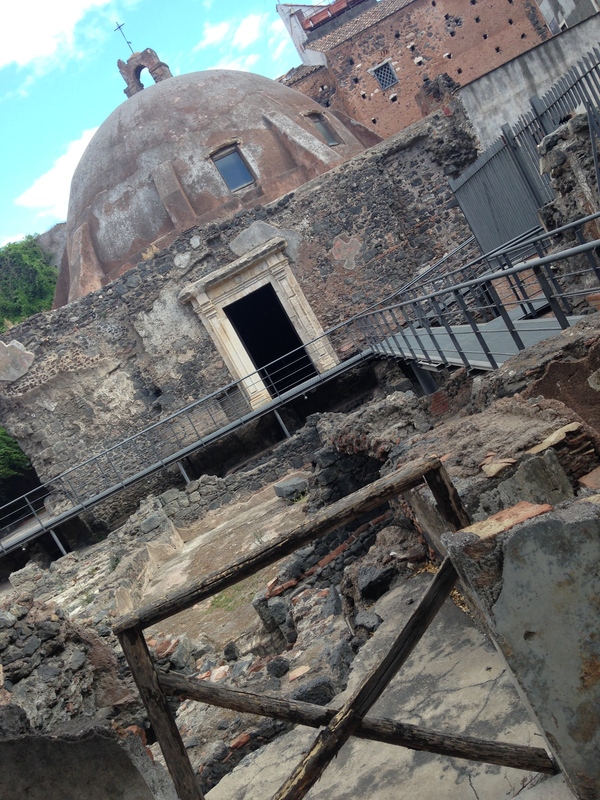 Over time, the Baths were literally forgotten and a neighborhood in the city of Catania was built over them. During that process, an Orthodox Church was built in the VII Century A.C. It was built over the original baths and later on it became a Roman Catholic church. This is the only building in the city of Catania that remained untouched by the 1693 earthquake. 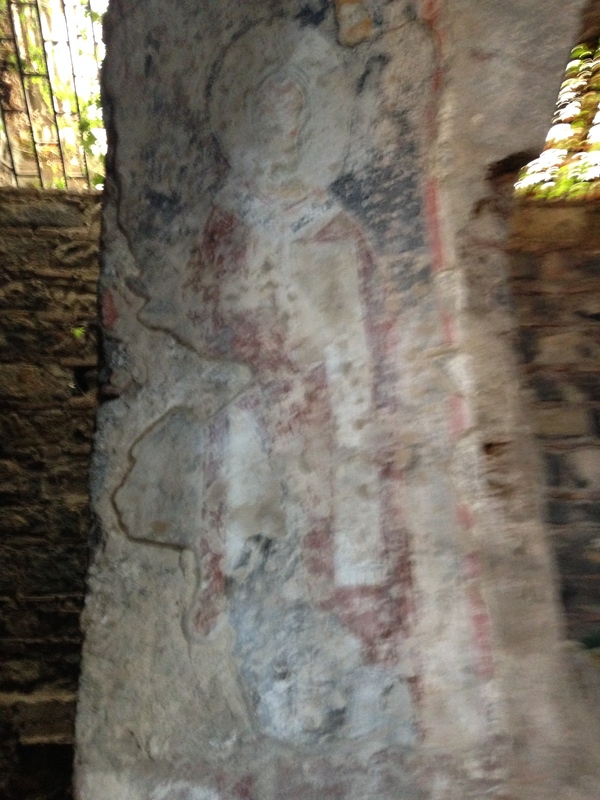 Not only did the church remain intact, but many of its frescoes testifying different times in history can still be seen today. This area of Catania was hit hard by the bombing of WWII in 1943. 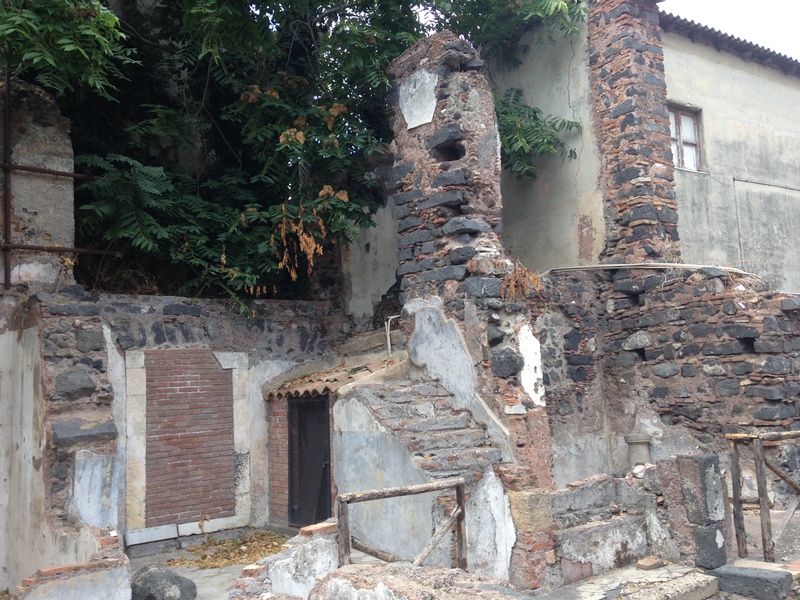 Today, one can see the ruins to witness the event as in the picture below of a building and a small chapel which had been built on the site in the XVIII century. 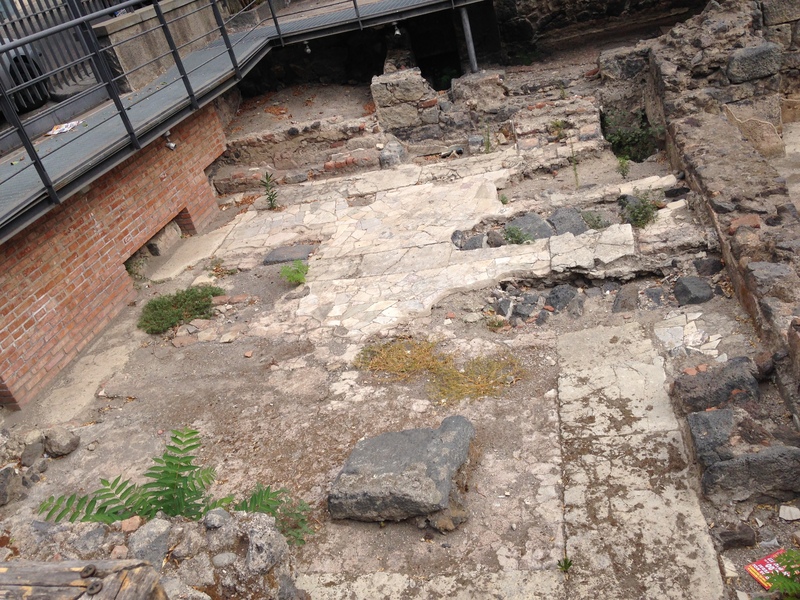 The picture below shows the area of the Baths that was the Sauna; the marble pieces of the floor are the remains of the original Roman floor. In this area heating was provided by warm air sent into the room through a pipe. Finally, on one side of the site, one can see the remains of a cemetery built in the Middle Ages.. When this cemetery was uncovered, the finding of 200 burial sites provided many artifacts and evidence to better understand the lives of those who were buried here. The remains below are believed to belong to a warrior, dating back to the period between the end of the XIII and the beginning of the XIV centuries. Based on the height of the warrior, it is believed this was not a Sicilian, but perhaps one of the soldiers fighting with Frederick II. 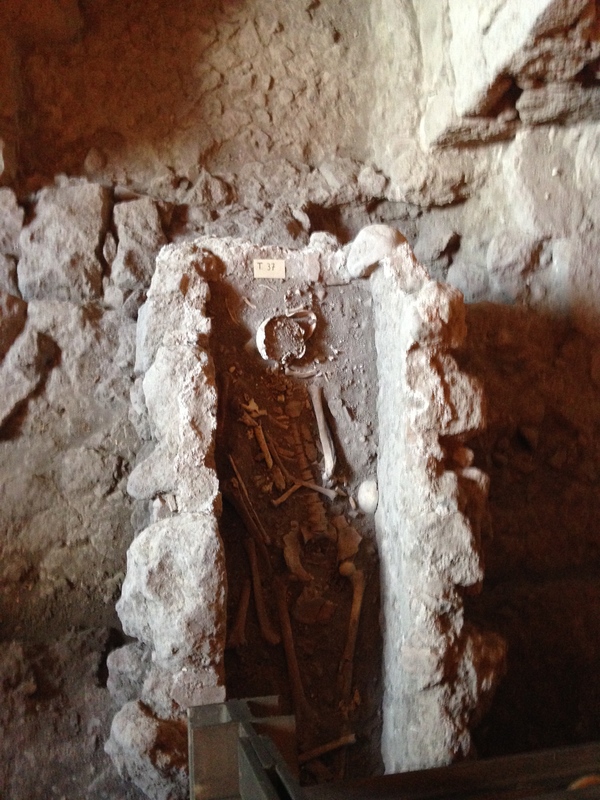 More excavations are about to start on this site which keeps unfolding precious layers of Catania’s history! We visited yesterday. It’s a very interesting place.